A muffin with butter and jam. 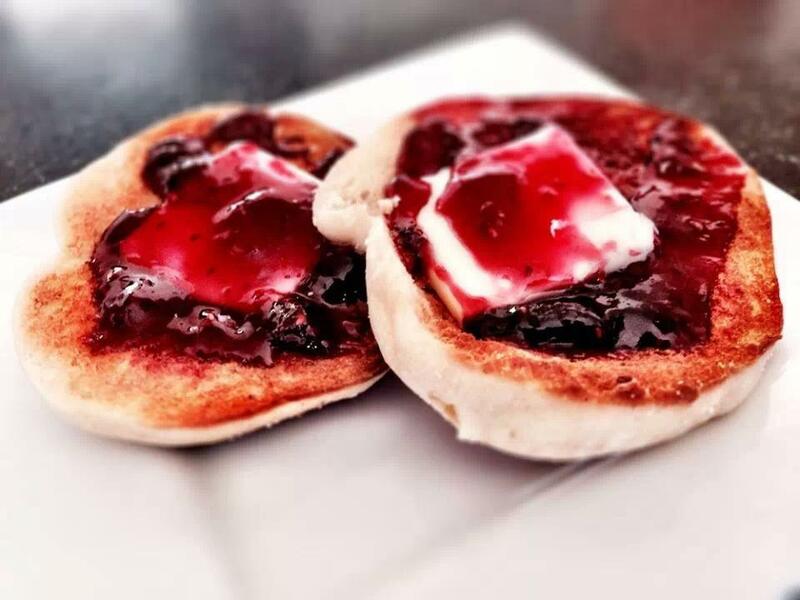 When Kyle Meekins was selling bread for a Concord-based bakery, many of his restaurant customers had the same request: Find an outstanding English muffin. He tried in vain, finally turning to his friend Dan Crothers. “You’ve got to make this thing,” pleaded Meekins. A chef who had worked at Hungry Mother, JM Curley, and other restaurants, Crothers was in what he calls an entrepreneurial phase. Having left restaurant kitchens, he had tried to start three companies and was working as a personal chef. “I had plenty of time to mess around with muffin dough,” he says. He nailed it. In March, Meekins and Crothers, who grew up in Wellesley and have been best friends since high school, began selling their Stone and Skillet English Muffins ($3.99 to $7 for 4). Initially, they were making them one at a time on a cast-iron skillet in Medford and delivering them by T. Then they rotated through friends’ restaurant kitchens at night until, in June, they moved into their own professional kitchen in Medford. The golden muffins are crunchy on the outside, nicely craggy within, made with five all-natural ingredients, and griddled on a flat-top. Spread them with a pat of butter or a little jam; make one the base of your breakfast sandwich or burger. They are as versatile as they are delicious. Available at Bee’s Knees Supply Co., 12 Farnsworth St., Boston, 617-292-2337; Pemberton Farms, 2225 Massachusetts Ave., Cambridge, 617-491-2244; Volante Farms, 292 Forest St., Needham, 781-444-2351; Wilson Farm, 10 Pleasant St., Lexington, 781-862-3900. 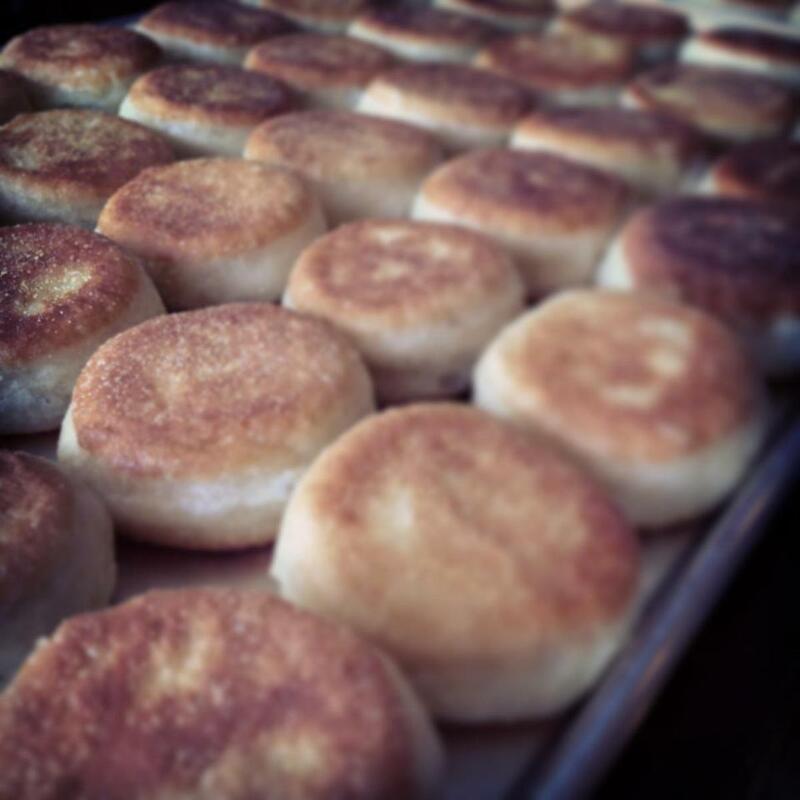 Once made individually, Stone and Skillet English muffins are now produced in a professional kitchen in Medford.